@WarHamSandwich If you were in charge of a codex revamp what would you like to see added/changed? So like a stereotypical internet Troll I’ve been grumbling about the latest leaked information for Chaos Marines. But the good folks at BOLS responded not by arguing, but by asking what would I do if it was up to me. So how about some rules that get these ideas across, and also give something distinctive? Let’s start with 1: Corruption. A recurring theme of chaos armies should be the corruption of the enemy through betrayal and weakening. The new shroud of deceit power does betrayal well via shooting, and the old lash of submission power did similar for movement. We need to see more of this betrayal concept of using your opponent against themselves, not just isolated in a single ability. As regards weakening, penalties to opponents that are flavoured to your warlord’s chaos mark would be great (as this also feeds into 2: strong leaders) e.g. maybe a Khorne warlord would add 1 to your opponents warp charge required to cast psychics (while he lives!) when within 24″ of Khorne Marines maybe a Nurgle version would be negating FNP when within range of Nurgle Marines. 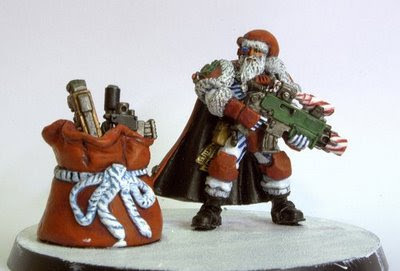 You could come up with similar for non aligned legions (Iron Warriors, Alpha Legion etc). Besides the warlord, what else could we do with Strong Leaders? Well I like the idea of mandatory champions leading squads, and I don’t mind the implied hubris that challenges are mandatory. But a better risk reward model for challenges would be getting a boon roll when challenges are issued or accepted, and getting to pick one when you win (except spawn/daemon result). I’d also suggest that a champion led squad is fearless or Ld10 stubborn while the champ lives, but that basic marines themselves are say fickle Ld7. Ld7 without a leader would fit the selfish (I’m outta here!) concept, but it’s not fluffy that masters of long term guerilla warfare would get wiped easily by being swept/overrun. So as a twist on ‘they shall know no fear’, CSM that fail their Ld7 in combat don’t get wiped they make a ‘tactical withdrawal’ (like when Horus died) and just fall back normally. On a more basic level I always felt that CSMs veteran status (and focus on survival) should be recognised in better survivability, like higher T or FNP or some other mechanic. 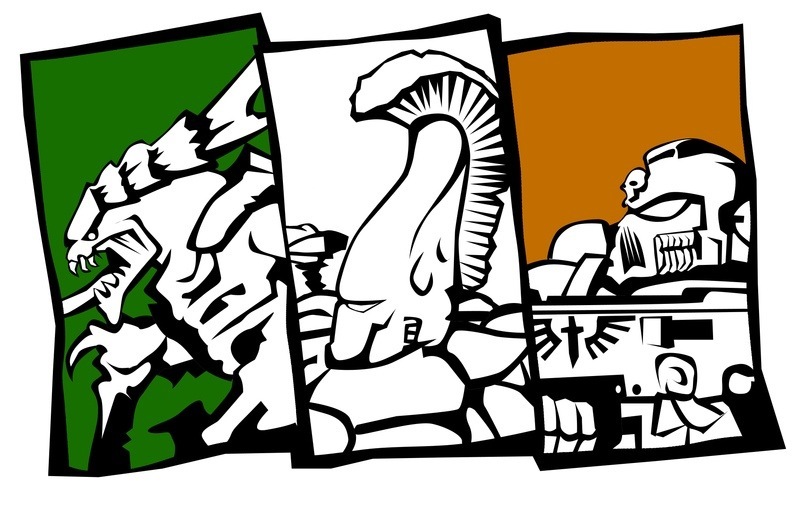 Outside of all this of course I want to see fluffy legion specific stuff – my own army is Alpha Legion and there’s no end of cool and unique ideas to bring them to life. Similarly for the others. It could really be great if they tried. So last time I put up a table of how the various armies performed (on average) at the ETC in Serbia. There were some interesting results, and today’s post follows up that line of thinking by comparing the popularity of army choices with their score rank. Popularity in this case just means how many teams included that army, and the table below puts the armies in order of popularity. 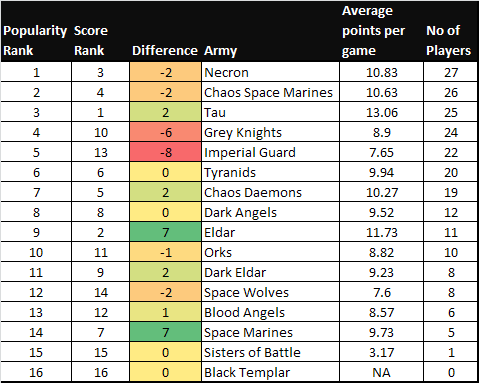 So the numbers in the ‘Difference’ column highlights any disconnect between how popular an army is versus how well it performed at the ETC. A positive number means that the army performed better than its popularity, a negative number means that its popularity was higher than its performance warranted. Tau weren’t the most popular army, but really the first three are so close that it makes little difference. The captains made those choices fairly rationally: Necrons, Tau, and Heldrakes are solid performers. Tyranids were fairly popular, and by the results that seems to be justified – similarly with Chaos Daemons (slightly under-represented), and Dark Angels. 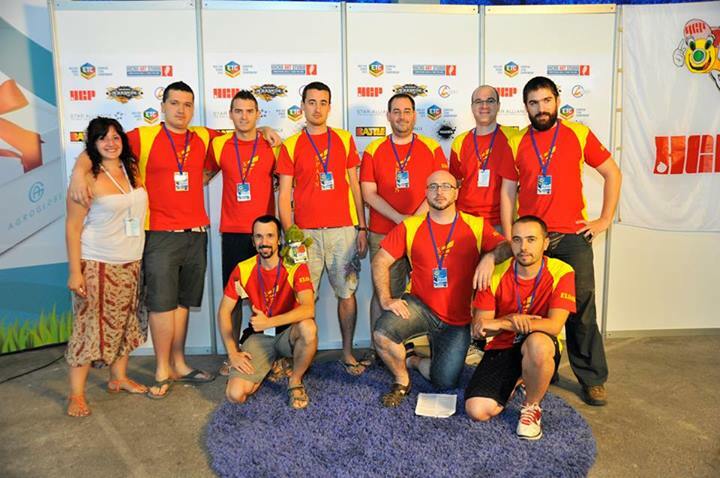 Eldar were quite under-represented and were the ‘sleeper hit’ of the ETC, doing quite well for the 11 teams that brought them. Of the remainder, only Space Marines have a big positive difference showing that they did a better job than their low popularity would have predicted. There is of course a big caveat here: armies fill particular roles on a team so simply picking the highest average scorers may very well lead you astray with too much of one role and too little of another. So we don’t have a magic formula for army selection just yet. It also creates an interesting mind game for next year: do you bring a team that works well against the popular armies of 2013, or do you focus on bringing what did well in 2013, or do you bring counters to what did well in 2013? How much will the new codices between now and Aug 2014 change the meta? Lots to think about for the new captains! 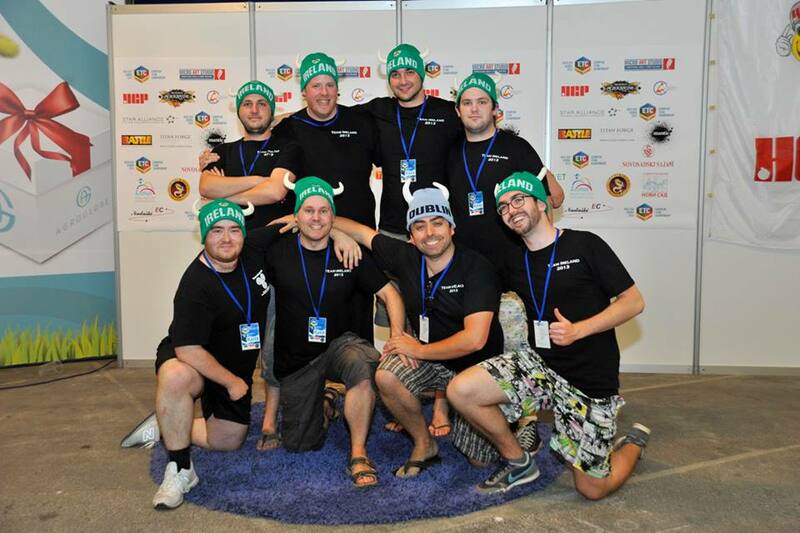 So the madness of ETC2013 is over, and the post mortem analysis can begin in earnest. I won’t start with my own team (Ireland), but rather I’d like to take a look at the overall meta. Thankfully my job has been made easier by the organisers who have already published lots of data on who took what armies and how they fared in the tournament. So, what armies generally did well? 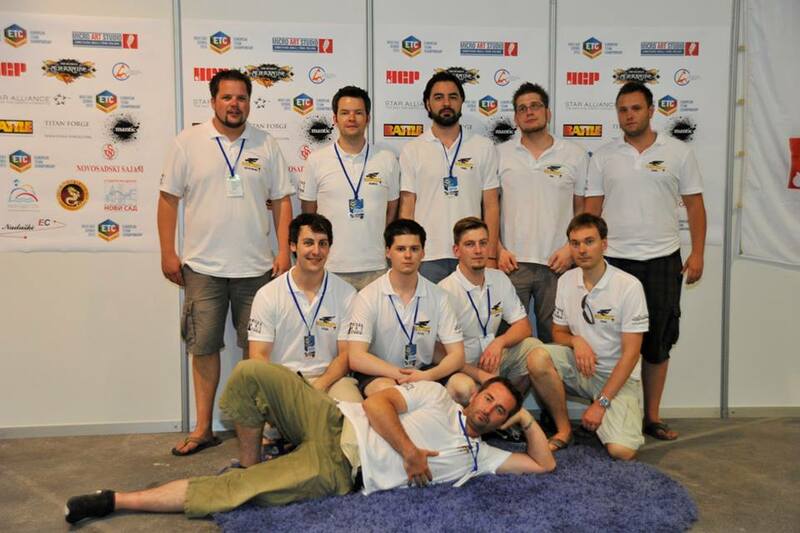 So the number 1 slot is probably no surprise to anyone, Tau are new and awesome, they wrecked face at the ESC and are probably doing well at a tournament near you right now. 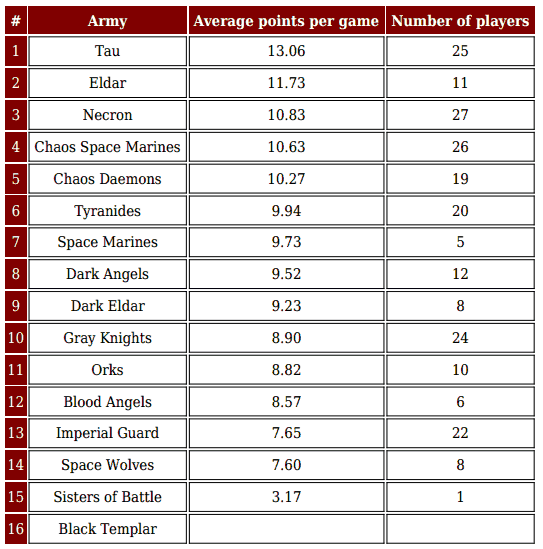 Necrons, Heldrakes, and Chaos Daemons round out the ‘winners list’ (i.e. the armies that are averaging >10 which is a win). Again this isn’t very surprising Necrons are still crazy powerful, everyone hates Heldrakes for a reason, and Chaos Daemons can certainly be deadly in the right matchup. It worth taking a moment to think about the remaining armies. Everything else on that list was losing on average (i.e. <10). But, that said, this table does give us a line in the sand as regards what the 2013 meta was like and I’m sure it will influence team and army selection for next year! I’m so proud of each and every man on that team – the whole experience is a bit hard to describe in words, so here’s a video. In other news, I’m standing down as Captain so hopefully I’ll have more time to put into the blog! 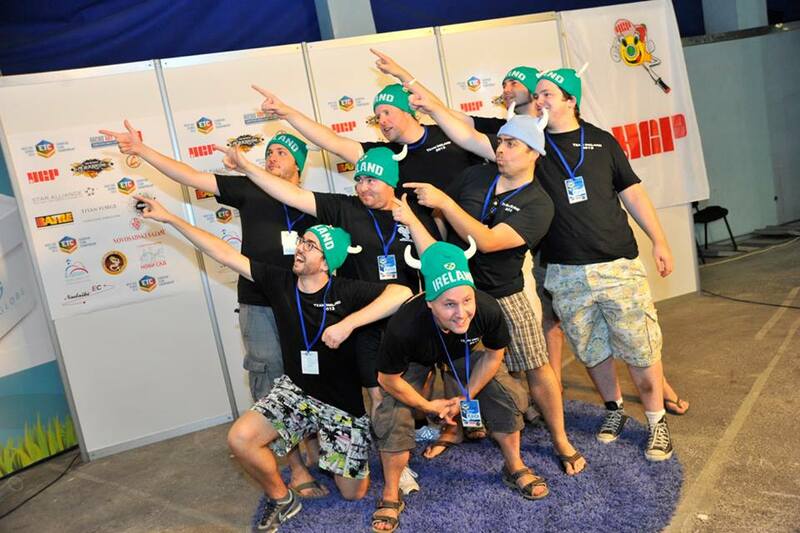 In 1972, a crack commando unit was sent to prison by a military court for a crime they didn’t commit. These men promptly escaped from a maximum security stockade to the Los Angeles underground. Today, still wanted by the government, they survive as soldiers of fortune. If you have a tournament, if no one else can help, and if you can find them, maybe you can hire… The Six-Nations-Team. Latest intelligence reports that Team Six Nations has been sequestered to a farm (possibly The Farm ) for a training weekend. Each of them has been chosen for this team because they individually have a set of skills and experience that strengthens the whole, and that is what wins team tournaments. With 2012 now done and dusted, I’m taking the opportunity to highlight some of the greatest hits of WarHamSandwich. In particular I’m homing in on the articles that have retained their relevance even with the many changes from 5th ed to 6th ed. 2013 will see plenty of new topics, and of course the updating of some old favourites for 6th edition. Best wishes and a Happy New Year to you all! I already gave you some basic rules for how to pick which dice to reroll for fleet, but they are specifically for charging in the open. Charging through terrain means 3d6 drop the highest, which means more complexity in terms of which dice to reroll. For your benefit dear reader, I’ve gone ahead and worked out the optimal rerolls, but they do require a more clunky set of guidelines than last time. A key distinction here is that when you make your initial 3d6 roll I’ve called the lowest die the min, the highest the max, and the middle one the mid – the best choice for a reroll depends on what you got for min mid and max in your first roll. This probably seems a bit impenetrable at first, so here’s a few notes on reading it. The range column is the range to your target, the three other columns are the conditions for a given range that you would reroll 1, 2, or 3 dice. For example, say you are 3” from your target, if you roll triple 1, then you should reroll all three dice, otherwise reroll the lowest two dice. As another example, say the range is 10”, if the highest of your dice (i.e. max) is 4 or less then reroll all three, if the sum of the highest and middle dice is greater than or equal to ten then just reroll the lowest 1d6, otherwise just keep the highest die and reroll the lowest 2d6.